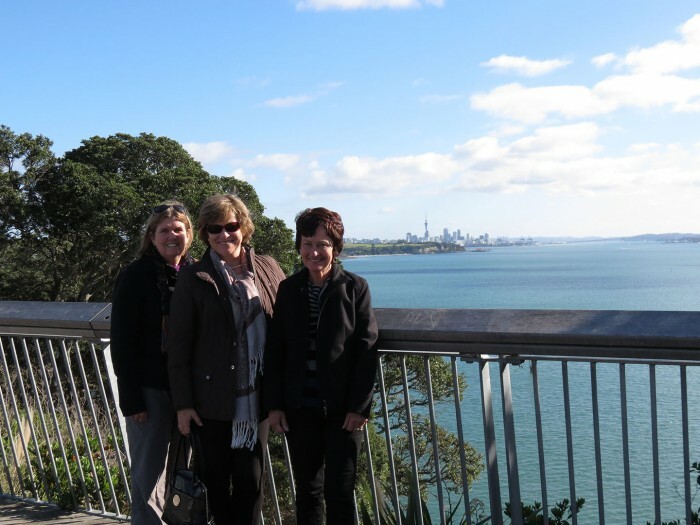 After leaving Kelly Tarlton’s, Alison and Hazel drove me up to the lookout so we could look out on the Auckland Harbor and beyond to the volcanic islands that dot the waters. Rangitoto Island is almost certainly Auckland’s most iconic natural landmark, with its distinctive symmetrical cone and location. In the last few years this, and other nearby islands have been cleared of mammals and the emergent vegetation is brilliantly green. I hope that I can visit these islands one day after they reintroduce the rare endemic birds found only in this country. Auckland has 48 volcanos that make for spectacular scenery and if one is so inspired they can all be climbed. New Zealand is part of the ‘Ring of Fire’ that stretches around the edge of the Pacific Ocean and where a large proportion of the Earth’s volcanic eruptions and earthquakes occur. 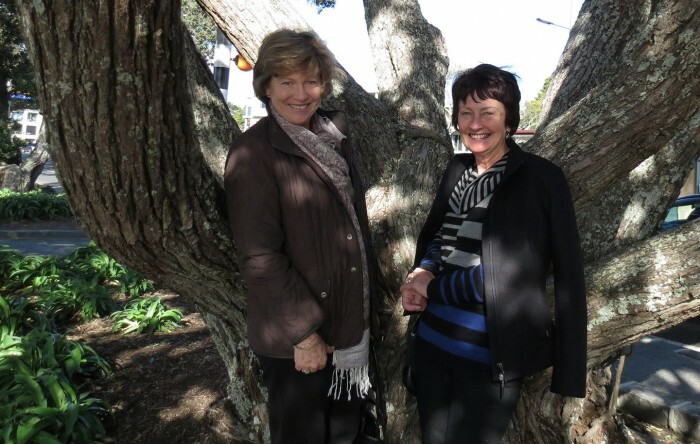 During our 2014 New Zealand tour, you may very well meet either or both Hazel and Alison. 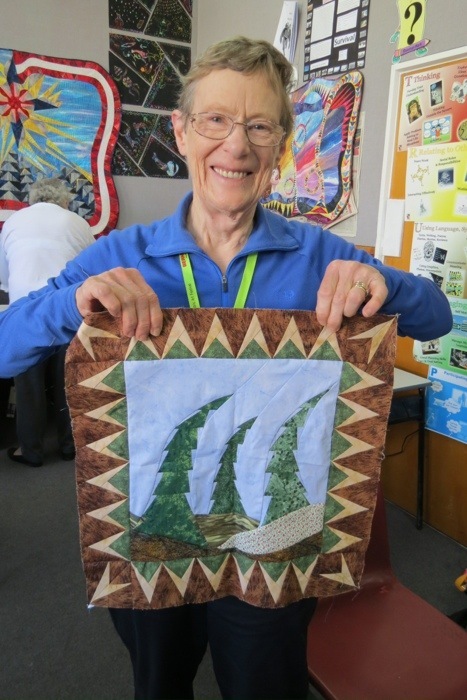 One of our stops is the home of Juliet Fitness, a well-known New Zealand quilter. 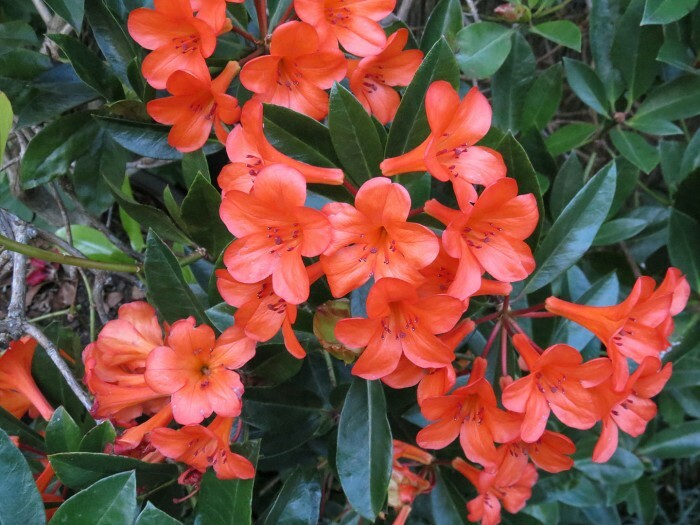 Her home is located in the hills west of Auckland on a 10 acre section of native bush. It is nothing short of amazing. After a lovely lunch at a beachfront cafe, we adjourned to Hazel’s garden and beautiful home to enjoy a cup of tea. Her garden was full of blooms even though it was the dead of winter. 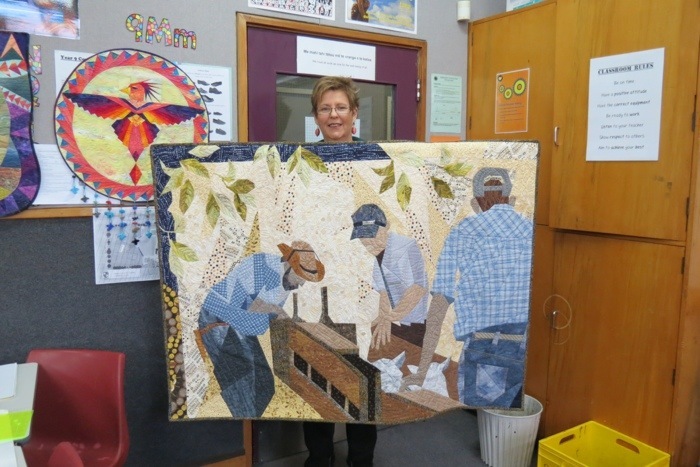 Hazel Foote’s Quilt for the Tutor’s Exhibit at Taupo Symposium. 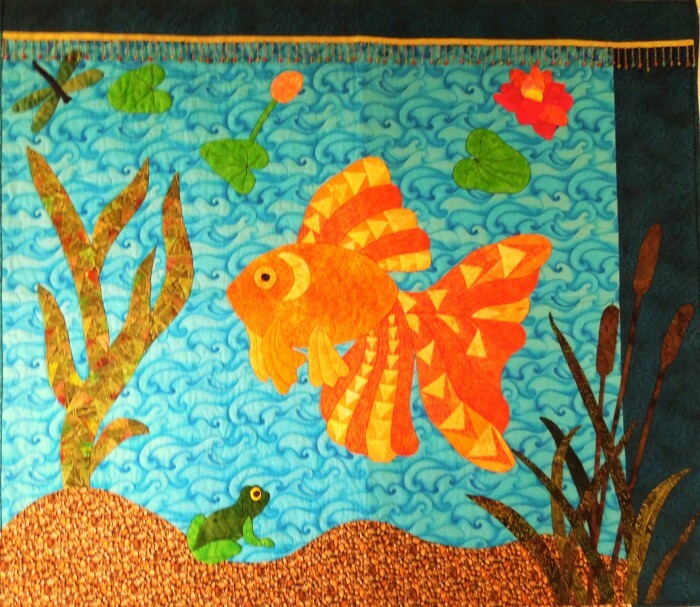 Hazel is a notable quiltmaker and designer. I did not learn the name of the quilt above, but it is stunning! 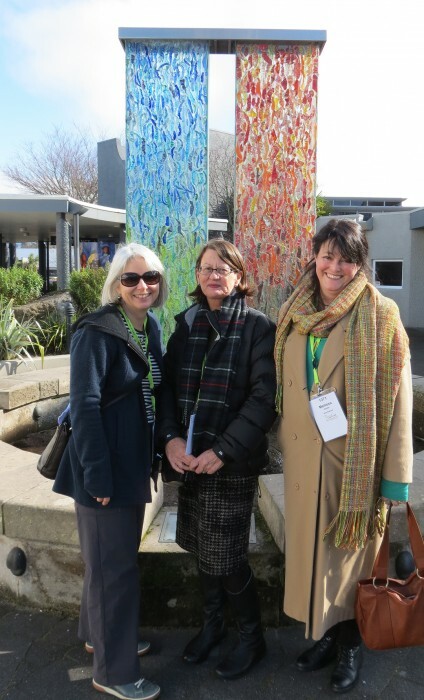 Hazel also was a tutor at the National Symposium in Taupo. I so appreciate the friendliness and camaraderie of my New Zealand pals! It feels like my other home. Back to the city, we traveled with new adventures in mind. 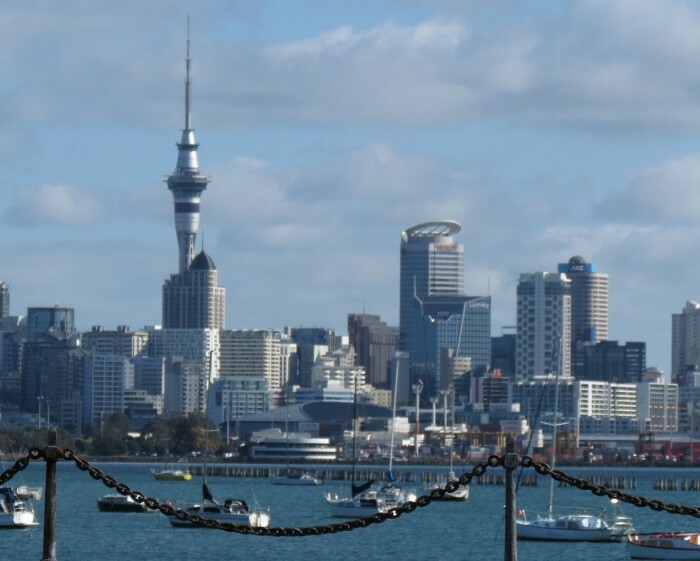 The skyline of Auckland is dominated by the Sky Tower. At 328 meters tall, (~1,000 ft), it is the tallest building in the Southern Hemisphere with its impressive spire! Visitors can ride to the top in the glass-fronted lifts to one of the three spectacular viewing platforms, or for more thrills and excitement, SkyWalk round the pergola, or even SkyJump off the Tower! Now, there’s a thrilling ride! You also can relax with a coffee or light refreshments at Sky Lounge or dine at Orbit – Auckland’s only 360-degree revolving restaurant. But, my new day hosts, Alison Laurence and Hazel Foote, had lowlier destinations in mind! 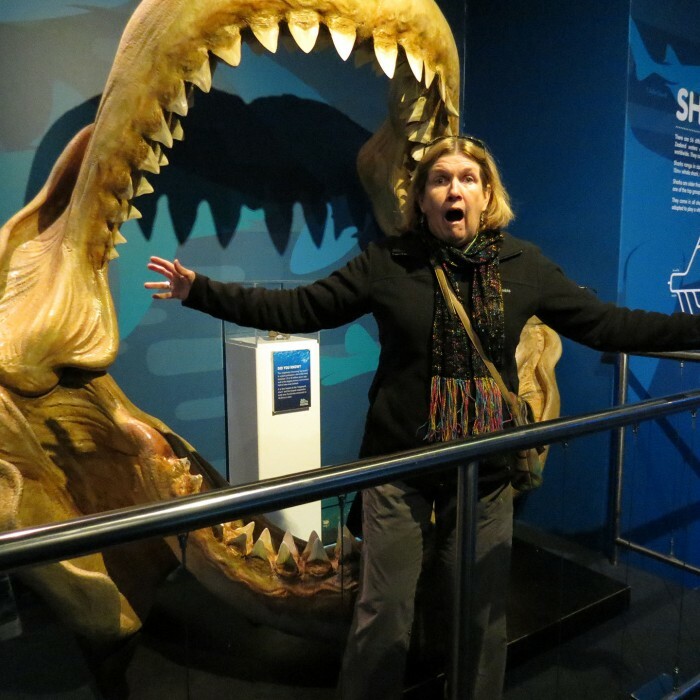 Knowing about my passion for all things feathered, we headed down to Kelly Tarlton’s SEA LIFE Aquarium. Built from the abandoned former sewage tunnels, it opened in 1985. 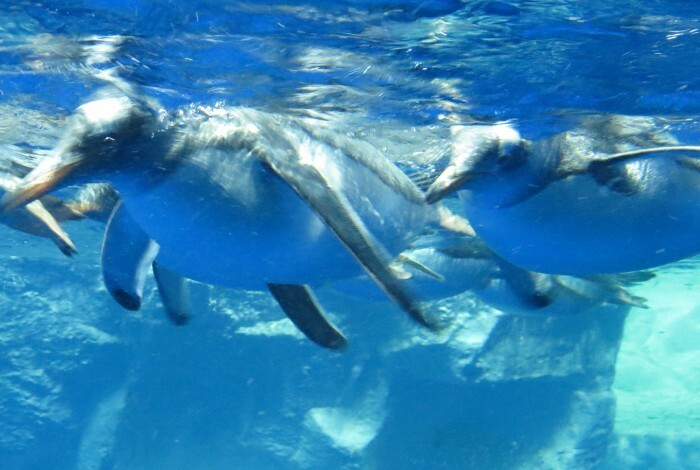 The original Underwater World was the vision of Kelly Tarlton – an extraordinary Kiwi adventurer, diver, explorer and inventor, who wanted to share his love of the ocean with others. 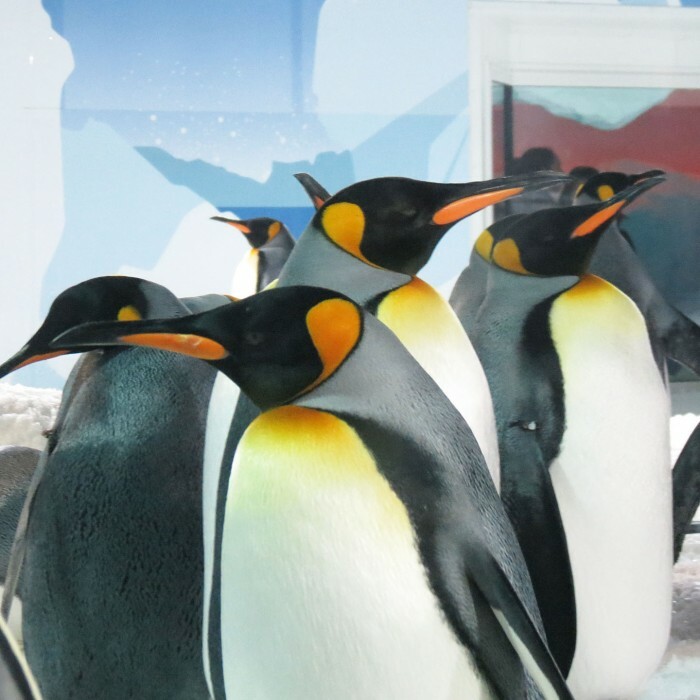 The attraction is made up of different zones, such as the Antarctic Ice Encounter, which is home to New Zealand’s largest sub-Antarctic penguin colony, offering a rare opportunity to see the magnificent birds up close in their icy domain. With the new walking paths, visitors can spend as long as they like watching the 80-strong colony of King and Gentoo penguins and their playful antics on the snow and their elegant flight underwater. Kelly Tarlton’s has undergone major renovations since my last visit there 19 months ago. Gone is the mock Antarctic vehicle that used to transport visitors through the tunnels. In its place are spacious walking tracks with large windows, perfect for viewing the penguin colony above and below ground. 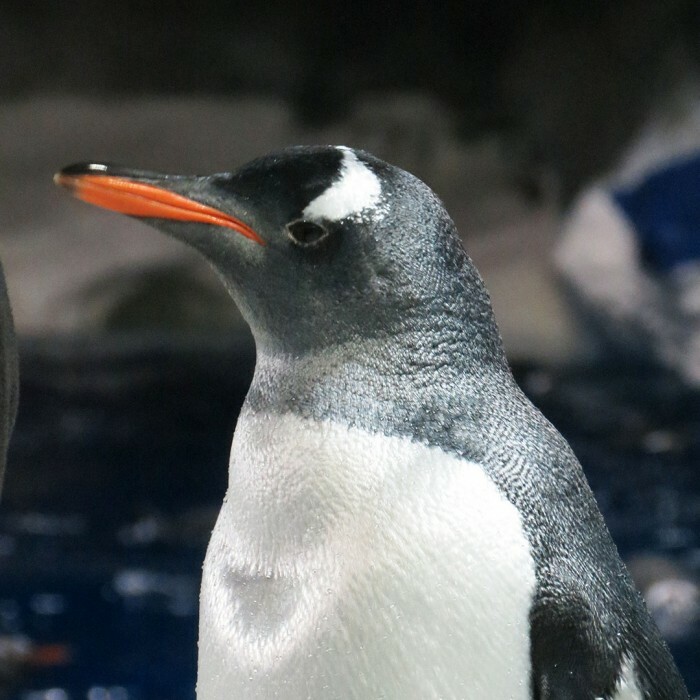 We got great looks at the Gentoo Penguins both above and below the surface. The larger King Penguins tended to stay aloof from the boisterous Gentoos. We were there for feeding time, which was a real treat. The second largest penguin, smaller only than the Emperor Penguin, no other bird has a longer breeding cycle. They take 14 to 16 months to fledge a single chick. During the winter, chicks may be left to fast for from one to five months (May to September/October). Adults can rear a maximum of only two chicks every three years. We were there for feeding time at 11 a.m. which was an extra thrill. One of the King Penguins is quite elderly and arthritic and spends much of the day on a heated area to help with this arthritic feet. He moves slowly but with determination. During feeding this charmer vocalized for his caretaker with whom he has bonded. Such a treat! 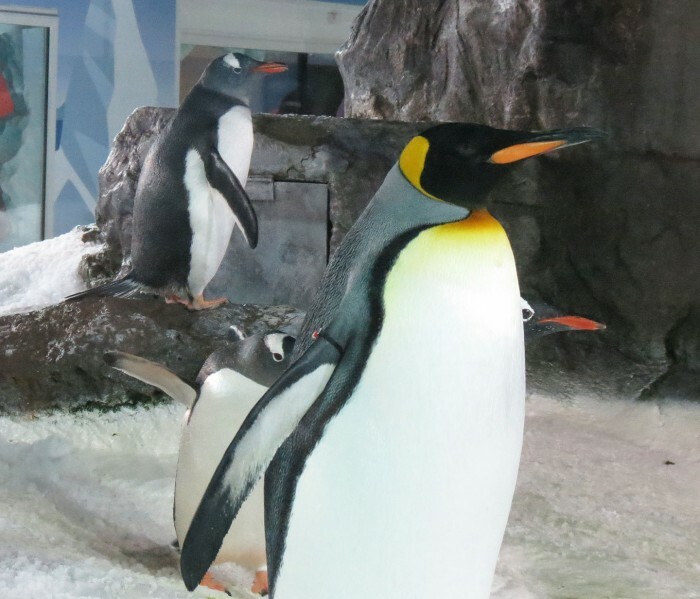 In addition to the penguins, SEA LIFE has an extensive museum with artifacts, photos and a walk-through replica of Captain Robert Falcon Scott’s Antarctic hut (established back in 1911), complete with authentic memorabilia offers a glimpse at what it was like to live 100 years ago in the coldest place on Earth. 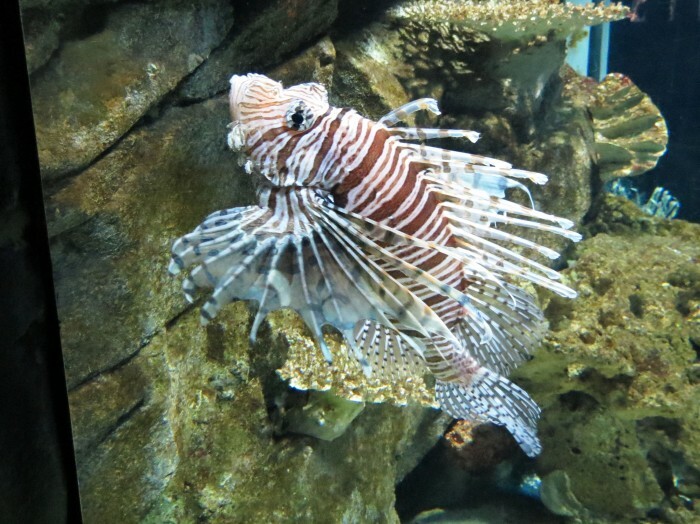 Of course, the aquarium hosts many forms of sea life in a huge array of tanks. However, it’s really hard to get a decent photo of any thing that is swimming in a tank of water, so this lionfish was the best I could do! In addition to being a major tourist attraction, SEA LIFE has established the SEA LIFE Conservation Fund (SLCF), an independent, non-profit organization dedicated to conserving and protecting New Zealand’s unique aquatic habitats and the incredible animals that live in them. SLCF is dedicated to conserving the marine environment by funding and carrying out research and educational projects that will help protect threatened species and habitats, and teach us more about the relatively little-known marine world. And then there were the BIG FISH I was happy that I didn’t meet! Or should that be meat? On my first full day in Auckland, Diane and Melissa took me on a tour to Northland, checking out quilt shops, cafes, and magnificent scenery. It wasn’t long before we stopped for morning tea, replete with sweets to provide energy for our outing. It was here that I was able to enjoy my most favorite ever coffee, a flat white. It seems to be a New Zealand/Australia espresso drink that is not available here in the U.S. Note that each of our sweets is divided into thirds. We shared! 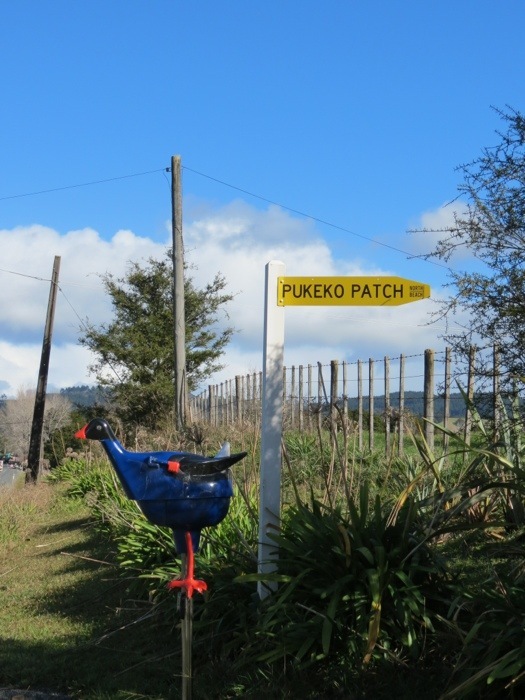 Along the way we stopped at the Pukeko Patch outside of Warkworth which was closed. Actually, the shop was open, but we had driven instead to the owner’s home in the countryside! Duh! So we never did get to visit that shop. I am sure it is wonderful. 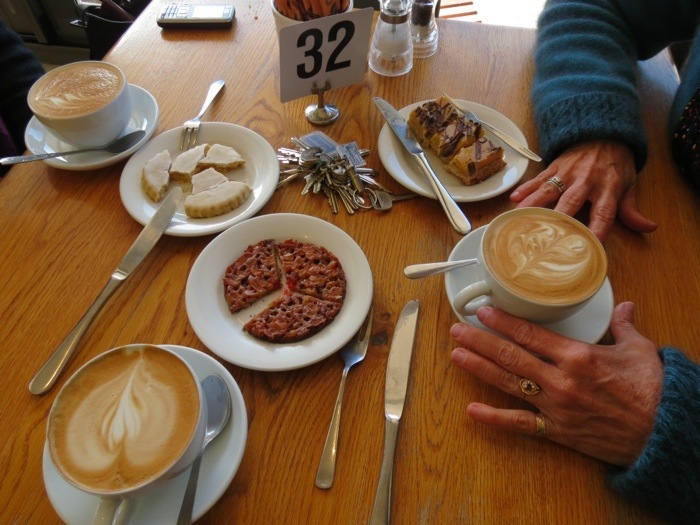 And, FYI, the shop is located in the community of Warkworth – right near where we had coffee. 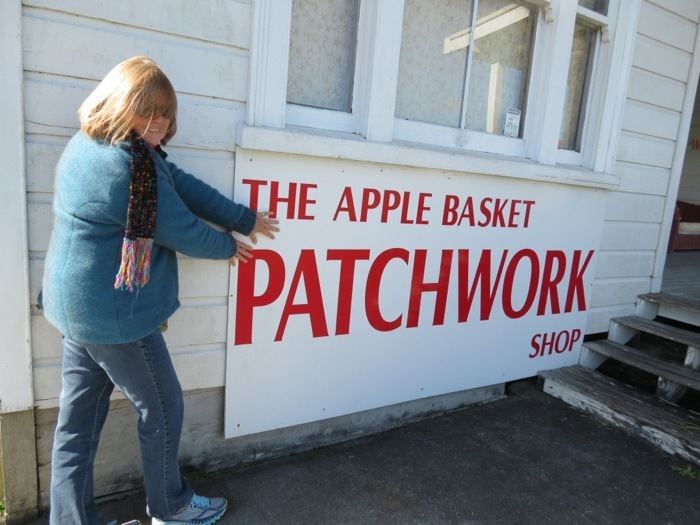 Our next stop was the Apple Basket Patchwork Shop, in Kaiwaka, where we were warmly welcomed. 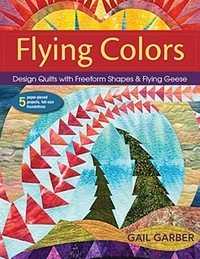 They publish a series of New Zealand style patterns for birds and flowers and the shop carries both the patterns and kits that include the fabrics. Be sure to check them out. Our final destination was the home of Kerry Glen, owner of Tulis Textiles. “Tulis” is an Indonesian word that means to write. 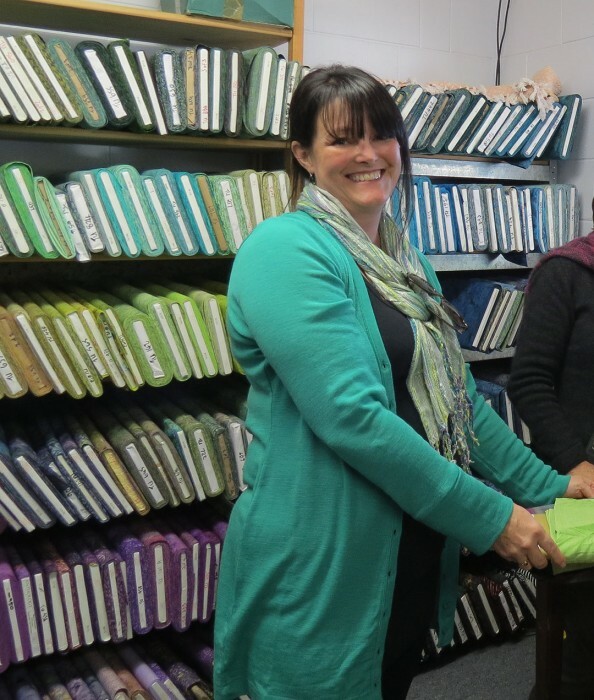 Although Tulis Textiles is located in Kerry’s home in Marsden Point, right on the water, she is open for business by appointment. Most of her business is conducted online and she has a substantial website. 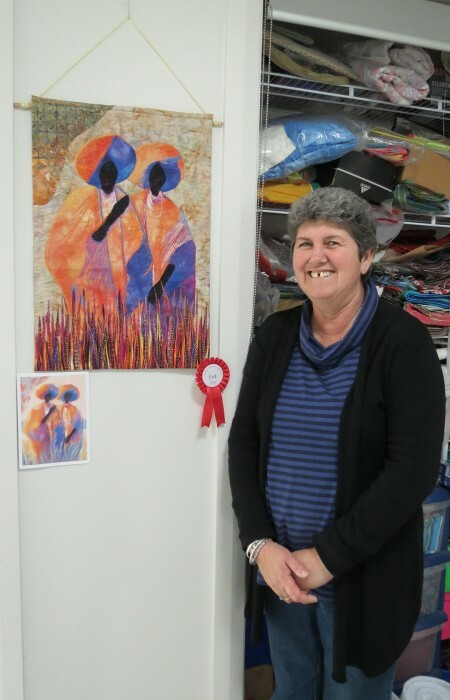 Kerry travels regularly to Bali where her collection of batik fabrics are dyed with her stamps and to her specifications, so she can maintain the quality, versatility and vibrancy of her fabrics. 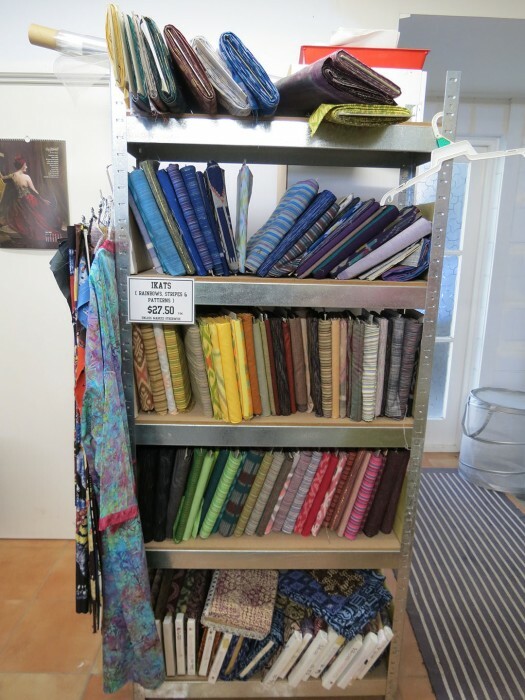 She stocks over 500 batik fabrics in a wide range of colors. Kerry also stocks a unique selection of hand-selected Ikats! It was so very hard to decide. We also enjoyed a lovely lunch with views over the sea, but all too soon is was time to pack up our parcels and head back to Auckland. 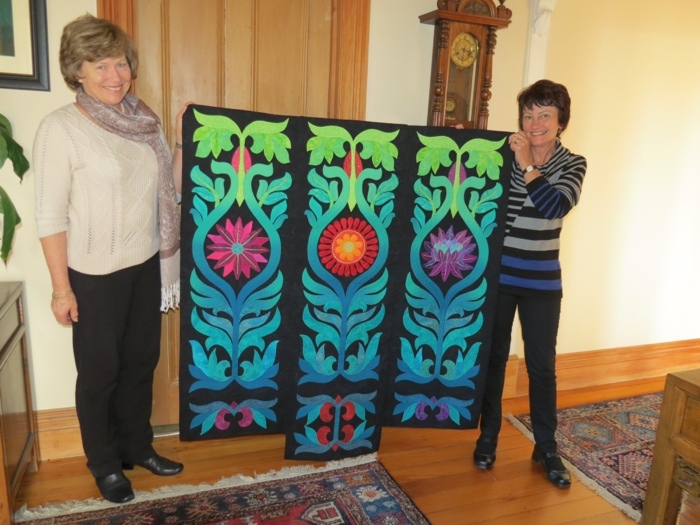 My April 2014 Quilting and Textile Tour of New Zealand will include tea and shopping at Kerry’s Home! I think you will love her fabrics. 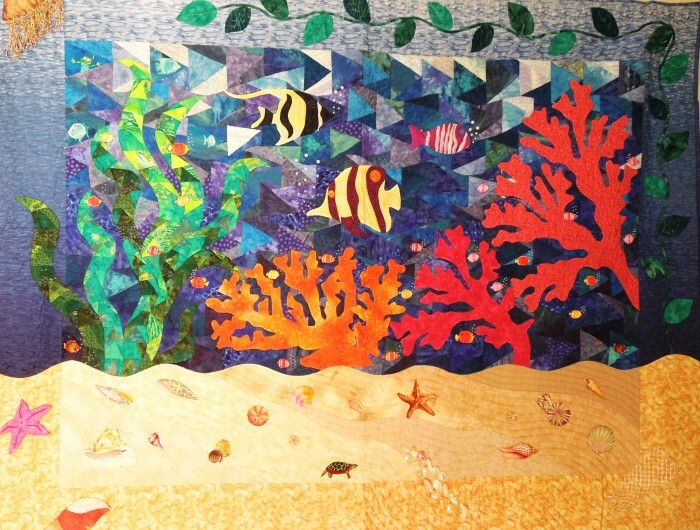 I’ve always loved the beach, the ocean and sea life, so that became my inspiration for these two quilts. I’m a scuba diver, so I’ve been lucky enough to see many amazing underwater sights. I learned how to transfer photos to fabric, and recorded my trips in quilts. I was fascinated by the painted carts in Costa Rica and attempted to replicate one in fabric. Unfortunately it doesn’t look as three-dimensional as it should. Many of the squares in the cart are photo transfer images from our trip. 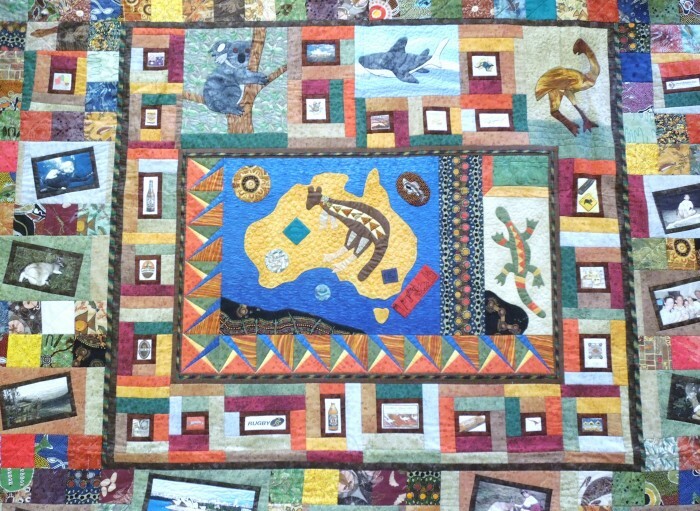 My son and I visited Australia and that inspired this quilt. I made one for him too, with photo transfer images from the trip. Then, my son and his wife had our first grandbaby! Now, he is my inspiration for making quilts. He is a very well-quilted little boy, since his other grandmother also quilts. 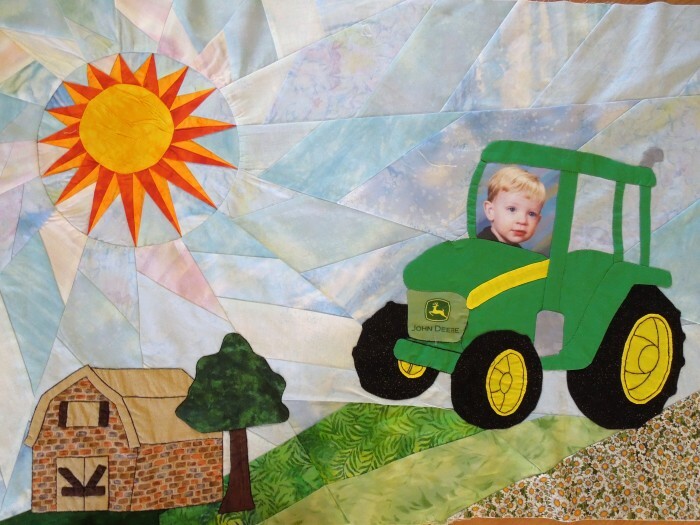 This is the quilt I am making for his second birthday. It’s in progress. Borders will be added. So I repeat the question that Gail asked – What inspires you? Tell Gail your story. Thank you for bearing with me as I posted single images during my trip to Taupo, New Zealand. Because I was using a APP on my iPad and because internet access was sketchy, I was limited in what I could post. I had a most wonderful time on this trip, where I was a tutor at the symposium, with many adventures, both quilt-related and touristy! This begins the first of several to come that highlight some of the wonders that occurred during this trip. My friends, Diane Anderson and Melissa Gelder (2 rightmost in image above) took me to see the quilts at the exhibition during one of our lunch hours. Taupo is filled with outdoor sculptures such as this one entitled, “Taupo-nui-a-Tia, the Great Cloak of Tia” by Lynden Over (2009). The first sculpture commissioned by the Taupo Sculpture Trust, it symbolizes the two sides of the legendary cloak. The colors of the glass feathers represent the lake, the river and the volcanic earth. Inside the exhibition hall, we first encountered the Special Exhibits area. Fireworks, by Ruth Wheeler of Whakatane was the winner of the Hoffman Challenge. Ruth reported that she enjoyed the challenge of working with the flower fabric, trying to use as much as possible in her original design. Another exhibit was the “Make a Statement Challenge”. 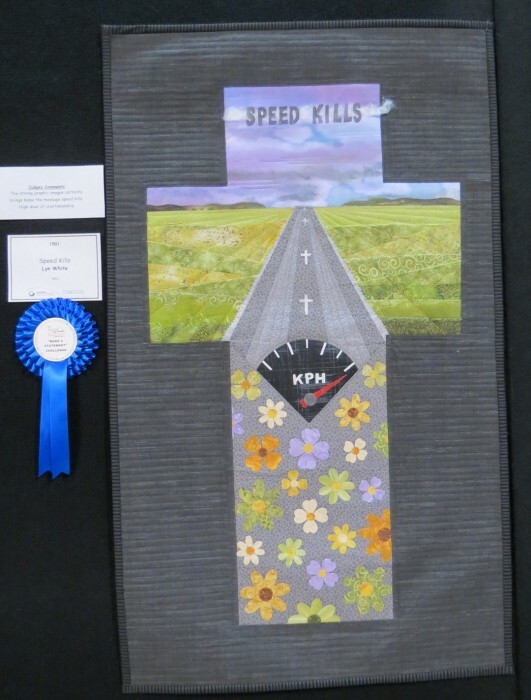 In the above quilt, Speed Kills by Lyn White, the message is clear. 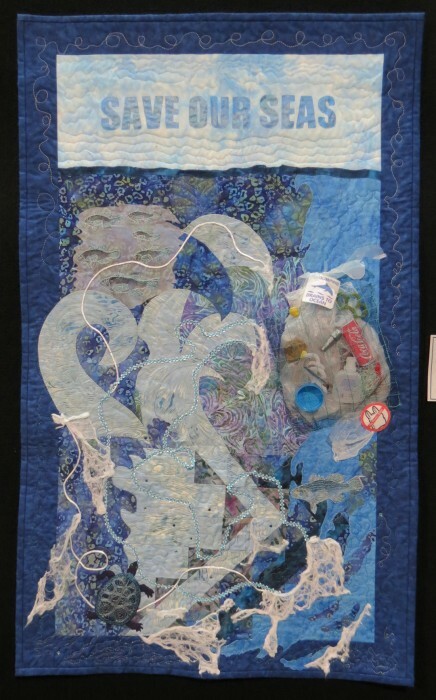 This quilt by Bridget Gill, bespeaks of the trash that has accumulated in the ocean, where The Great Pacific Garbage Patch extends over hundreds of miles. 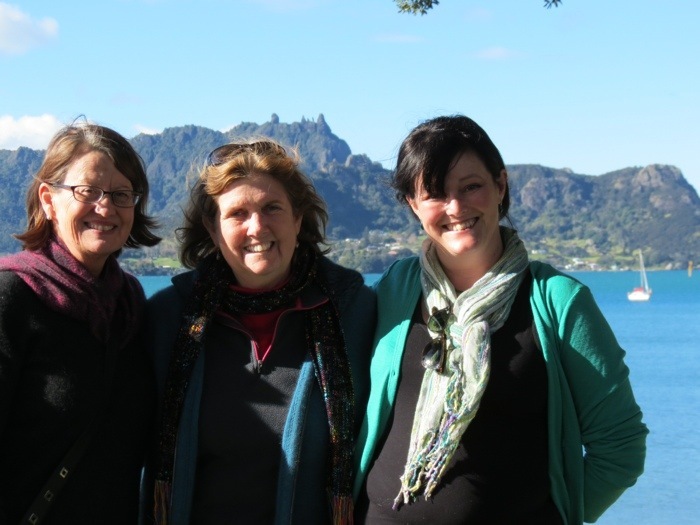 Learning on Shaky Ground by Heather McOnie was particularly poignant as a major earthquake struck Wellington, New Zealand, four hours south of Taupo, during the week we were there. Although no shaking was felt in Taupo during this time, there was a strong odor of sulphur on the days of the heaviest geologic activity. I learned about GeoNet, a website that tracks the Earth’s movements in New Zealand. It’s a fascinating site that I checked daily, drawn by the numerous shakes right about then. It was at this very same time that the White Island volcano, located in the sea north of Tauranga, also roared back to life. 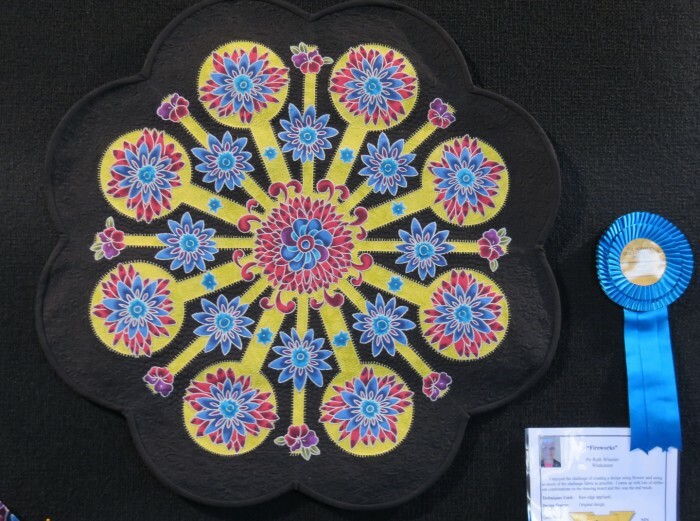 This creation by Lee-Ann Newton, won viewer’s choice as well as best non-traditional quilt at Symposium Taupo. 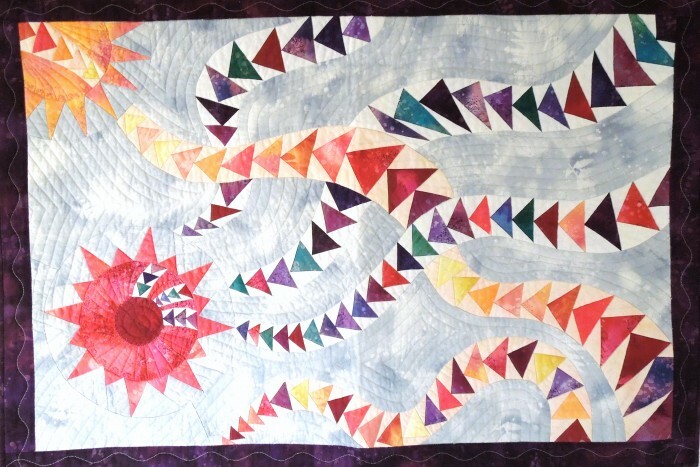 She purchased an old quilt top and then painted over the surface and quilted it. It is truly an amazing original piece! 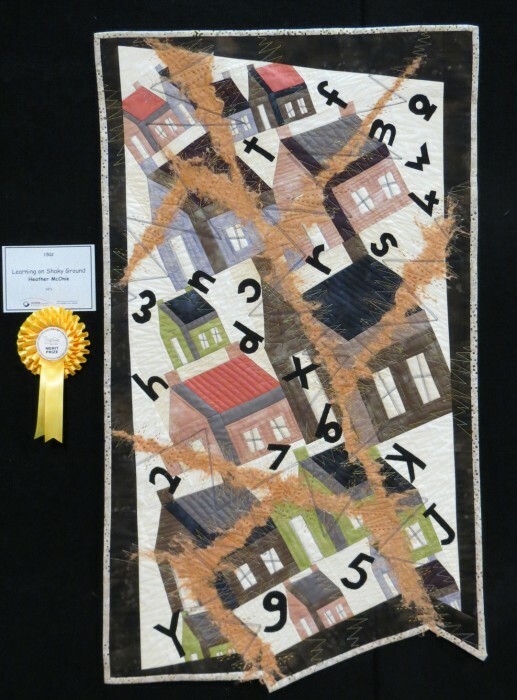 One of the many wonderful quilts at Symposium! 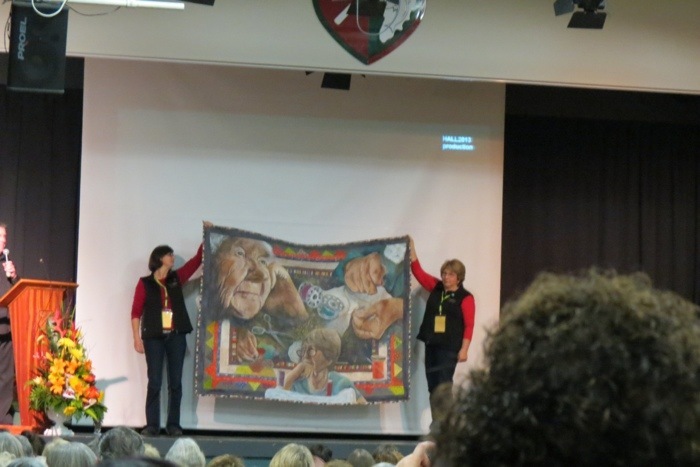 Alison Henson brought this beautiful quilt to class yesterday. Called “Drafting Lambs”, it was done from a photo taken at weaning time. This original design features her husband Alan, Dean Lindsey and Jim Brooks. Iris dedicated to the memory of Jim Brooks who farm shared with them from 2003 to his untimely death in 2011. 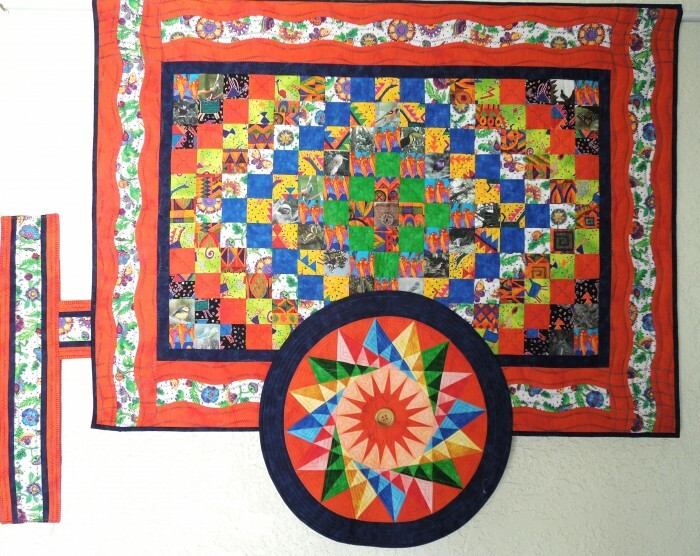 What an amazing quilt this is! Today is day 2 of my three day design workshop, Flying Colors. Yesterday, Marilyn Foreman brought her completed project to class. She made the Tiny Trees pattern from my book, but then designed her own outer border using pointy Dudes! I just love it! Thanks for sharing Marilyn.